How Health Care Dropped Out Of The Presidential Conversation : Shots - Health News The public remains deeply divided over the law overhauling the health system. And a new poll finds a majority of Americans believe the law's insurance mandate will be found unconstitutional by the Supreme Court. Courtesy of The Advisory Board Co.
Health wonks were miffed about the lack of attention their beloved issue got in President Obama's State of the Union address Tuesday night. "Health care still 1/6 of the economy and growing. Wouldn't know it from #sotu," tweeted an irritated Austin Frakt, a health economist at Boston University who yesterday co-authored a longer response to the president's missing mentions on the Journal of the American Medical Association's website. 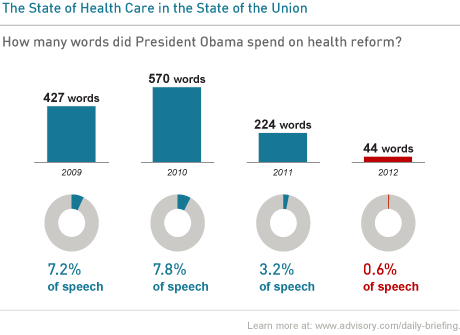 Dan Diamond, managing editor of the Advisory Board Company's Daily Briefing, put together a graphic showing that the 44 words on health in this year's speech the president devoted to health care — accounting for 0.6 percent of the address — was by far the lowest of his presidency for State of the Union Speeches. In 2010, health consumed nearly 8 percent of the speech. Even last year, after the Affordable Care Act was law, the president devoted 3.2 percent of his address to a victory lap. So why the silent treatment? A look at the latest monthly tracking poll from the Kaiser Family Foundation might offer a few clues. The public remains deeply divided over the law, which we've known for a while. This month's spread, for what it's worth, finds 37 percent with a favorable view of the law, and 44 percent with an unfavorable view. This month, however, pollsters asked the public about the pending Supreme Court case over the constitutionality of the requirement for most people to have health insurance starting in 2014. That's the so-called individual mandate. And the findings might raise some eyebrows. Nearly 6 in 10 respondents said they expect the justices to render a decision based not solely on legal analysis, but will "let their own ideological views influence their decision." Only 28 percent of respondents said they expected the high court to base its decision purely on the law alone. And by the way, the public still doesn't like the mandate, which has long been the most unpopular element of the law. Fifty-four percent of those surveyed said in their opinion it is unconstitutional, and 55 percent said they thought the court would reach that conclusion. But that doesn't mean the public agrees with Republicans when it comes to health care, either. Now you know one reason why Mitch Daniels, the Republican governor of Indiana, didn't talk much about health care in the GOP response to the State of the Union address, either.